represents the rate at which the body expends energy to sustain basic life processes such as respiration, blood circulation, heartbeat,renal function, and energy need to stay awake. How can we measure BMR/REE? determined when he/she is in a postabsorptive state (no food intake for 12 hours), is lying down, completely relaxed (motionless), neutral temperature of the room. whenever the proportions of body tissue change in relation to one another. *metabolic activity of these organ tissues accounts for about 60% of basal oxygen consumption, whereas muscles mass accounts for only 25%. A second component of EE is TEF. - represent the increase in EE associated with body's processing of food due to: digestion, absorption, transport, metabolism, storage of energy from digested food. protein in foods has the greatest thermic effect, increasing EE 20% to 30%. Proteins increase EE more than carbohydrates or fat. A common value ascribed to the thermic effect of food is ____% when a mixed diet is consumed. The value most commonly used for the thermic effect of food is 10% of the caloric value of a mixed diet consumed within 24 hours. When TEF metabolism reaches maximum? Most variable component, also the only component that that is easily altered. Oxygen consumption and thus energy expenditure can remain ___ for a short time period after the exercise activity has stopped. measures consumption of O2 and the expiration of carbon dioxide. How can we measure indirect calorimetry? what is RQ and what it represents? The amount of Energy expended can be calculated from the ratio of the carbon dioxide expired to the oxygen inhaled. This ratio is known as respiratory quotient RQ. RQ provide a meaningful information with respect to both EE and the biological substrate ( carbs or fat) being oxidized. RQ <1 for fat because fat is much less oxidized fuel source (fewer O2 molecules). What is an approximate RQ for protein? How to estimate RQ for proteins? What can RQ estimate mean? At a specified later time, measure the amount of each isotope remaining. *only 2H2 can only be excreted as H2O. How can we calculate production rate of CO2? How can we calculate O2 consumption? To access O2 consumption, a food quotient (FQ) is calculated from diet records kept throughout the testing period. calculated to access O2 consumption in doubly labeled water method. What is main source of error for FQ? main source of error is usually in the food records. How can we calculate energy expenditure from doubly labeled water? 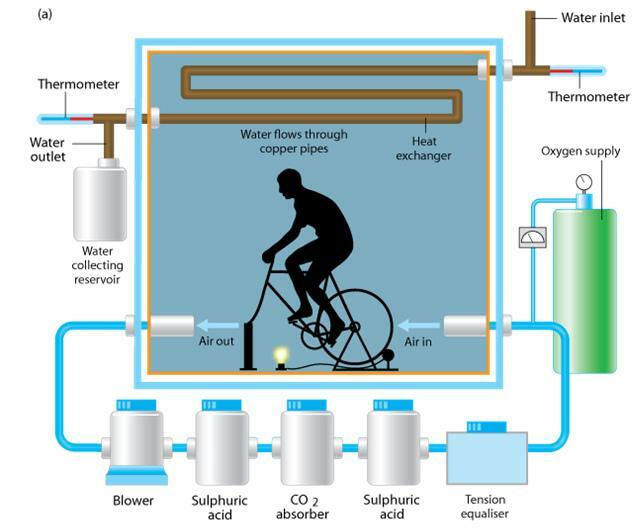 calculate the energy expenditure from the CO2 production and the O2 consumption derived from the FQ. Based on data on total daily EE measured by doubly labeled water method, equation for estimation of energy requirements was developed. Explain oxidative and substrate level phosphorylation –what are they, how are they different and what is their importance in metabolism. Give an example of substrate level phosphorylation. oxidative phosphorylation = electron transport chain, major supplier of E from lipids and amino acids. Substrate-level phosphorylation is directly phosphorylating ADP with a phosphate and energy provided from a coupled reaction. SLP will only occur if there is a reaction that releases sufficient energy to allow the direct phosphorylation of ADP. 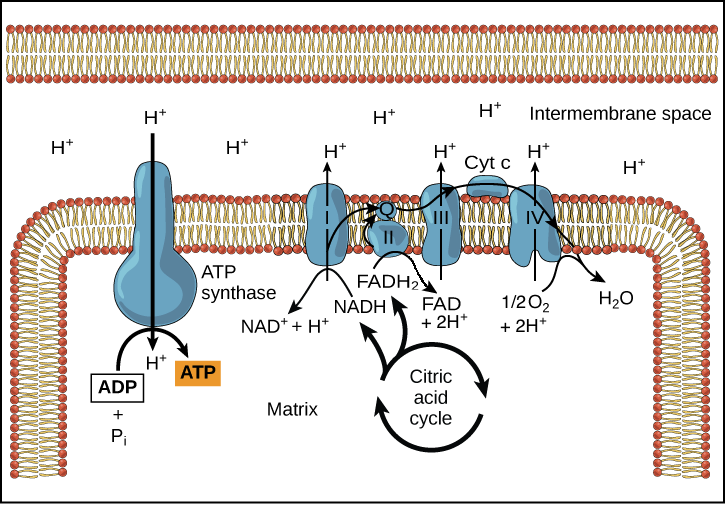 Oxidative phosphorylation is when ATP is generated from the oxidation of NADH and FADH2 and the subsequent transfer of electrons and pumping of protons. That process generates an electrochemical gradient, which is required to power the ATP synthase. Explain (in general) how energy is transferred to ATP in the electron transport chain, using the chemiosmotic theory. This process, in which energy from a proton gradient is used to make ATP, is called chemiosmosis. According to the chemiosmotic theory, the flow of protons into the matrix drives ATP production. Explain how salicylic acid interrupts oxidative phosphorylation. High doses of aspirin can increase body temperature by uncoupling the proton gradient. The diffusion of the protonated ( acid) form of salicylic through the mictochondrial inner membrane and the release of its protons in the matrix. The process reduces the proton concentration gradient across the membrane. This slow the passage of protons through ATPase channels and interferes with synthesis. UCPs are transmembrane proteins that decrease the proton gradient generated in oxidative phosphorylation. They do this by increasing the permeability of the inner mitochondrial membrane, allowing protons that have been pumped into the intermembrane space to return to the mitochondrial matrix. Understand what thermogenin is, its importance and be able to explain how it works. Describe where energy comes from under conditions of low physical activity, short-term high activity and long term activity. metabolism, and in which parts of metabolism each are involved.